Happy 7th Gotcha Day, Brulee! It's hard to believe that 7th years have passed since this beautiful and quirky little fur child came to live with us. We shared a lot about Brulee on her birthday post this year. Brulee came to live with us about two weeks earlier than most reputable breeders of Persian Cats allow to happen. Most breeders will wait until the kittens are at least 12 weeks old before sending them to their forever home. Maris, who is a cat behaviorist, and Signe, who is a veterinarian and pet groomer, from PET happy share about the appropriate development of kittens and how to know when it's time to leave the mother and litter based on three very important aspects in the early life of kittens. The end of nursing must be gradual. Normally, nursing should end between 8 to 10 weeks of age. Sometimes, nursing takes longer and will not end until after 12 weeks. The socialization period is between 2 to 8 weeks. Kittens play with their littermates actively until 12 to 14 weeks, when object play gradually replaces it." I remember visiting Beignet right before he died and even though he was eating regular kitten food, he was still nursing some. Brulee was already eating solid food and was playing with her littermates. She really hadn't gotten to the phase of "object play" yet. As I look back on our decision, I may have waited a couple more weeks before bringing her home. I'd been down to Mt. Pleasant a couple of times since Brulee was born and had developed a connection with her. Truffle came to live with me on September 4 and had really begun developing a close bond with me and Terri was concerned if we waited much longer, there may be some difficulties with Truffle accepting Brulee. Truffle followed me everywhere I went throughout the house (almost tripping me on a regular basis) those first couple of months. At the time, I agreed with Terri that it would probably be a good idea to bring Brulee into my home a little early. Once again, Terri chose to bring Brulee to my home like she did Truffle in September. She usually meets the new parents halfway or they come to her home. I was so excited and nervous to have Brulee home with us. This was the first time I'd ever had more than one pet and hoped I could give both of them the amount of attention they'd need. Terri brought Brulee into my home and Truffle immediately hissed! It was funny seeing this small kitten hiss at another kitten. Brulee got out of Terri's arms and immediately began checking out the place with Truffle close behind. I remember being very concerned that Truffle would hurt Brulee because she was so much larger. Brulee proved she could take care of herself. There were a few times Truffle would pin her down and I would pick up Truffle and move her away from Brulee, but Brulee would pop right back up and continue with her exploration and playfulness and "picking" at Truffle. I took off work those first few days to make sure the girls would be okay. I slept in the living room with them that first night. Turns out I had no reason for concern because they developed a sisterly bond that first day. Truffle is still the alpha in the home and lets Brulee know it, but Brulee can take care of herself. Terri stayed until Brulee found the litter box and saw that the girls would be okay. Truffle followed Brulee around all day, hissing as she did, but Brulee took it all in stride. She played, ate, used the litter box, and fell asleep. My favorite photo of her that first day (shown above) was when she had fallen asleep next to me on the couch and I had to get up and Brulee fell right on her back with her front paws stretch out and her back paws up to her chin. She was so tired, she didn't wake up. I still smile when I look at this photo and remember that day. Our new family was now compete! 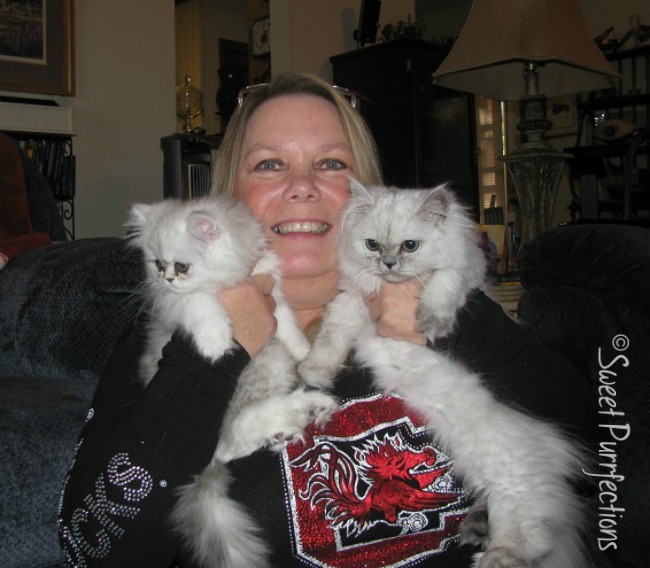 I'd been through so much that year with losing Sweet Praline from cancer and then little Beignet from another cancer. I could finally laugh again with my two beautiful girls. They've brought me so much joy over the last 7 years and I hope there are many more together. 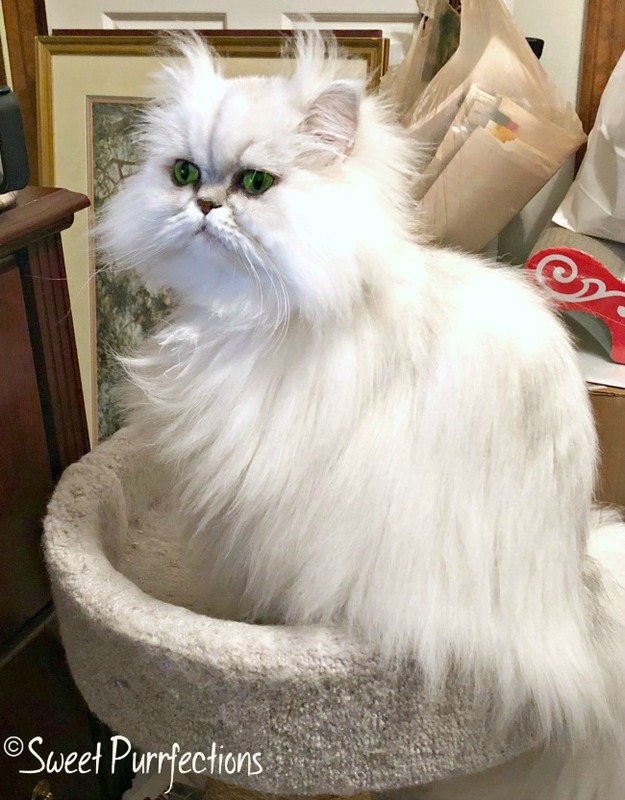 Brulee has grown into a beautiful Persian Cat with a unique personality. She likes to sit around looking beautiful, but she has a little stubborn streak! She insists on eating in different parts of the house and won't move from her chosen place until I bring the food to her. She has "cottony-soft" fur that mats very easily and I'm still working with her on grooming because she doesn't like it. She will only climb onto my lap when I'm in the bed and she will become a snuggling purr machine there. She still doesn't really play with toys on her own, but will leap and run when I pull out a wand toy. She prefers to play with me! She "puts up with" Truffle. When Truffle wants to play, Brulee will let her know that isn't her preference. They hadn't been very close the last few years until the last month and I've caught them sleeping close together again. Brulee likes to be near me all the time, whether it's on the bed with me, beside me at the computer, or behind my head when I'm watching TV. I'm so glad I chose to have a second kitten after Beignet died and that Brulee chose me to be her human mom! Happy 7th Gotcha Day my sweet little girl - Crystalpurrs Creme Brulee! Happy Gotcha Day! Sounds like it's quite the celebration. Happy Gotcha Day! I love the photo of brulee asleep bless her. 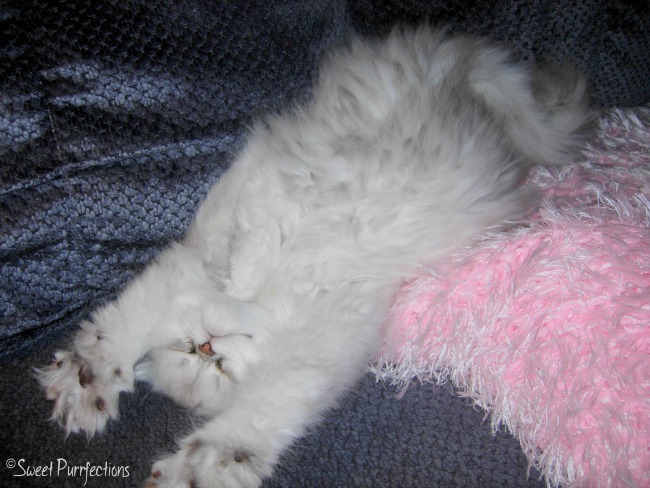 I love kitten photos when they're just so tired they fall asleep and nothing will wake them. We remember when you came home beautiful Brulee, Happy Gotcha Day sweetie! Happy gotcha day to Brulee! What a spunky little kitten she was! Happy 7th Gotcha Day lovely Brulee! I hope you had a wonderful day! We did not see this until today! Happy Gotcha Day sweet girl! Happy Gotcha Day, Brulee - and many more ! Happy Belated Gotcha Day Wishes to you my silver doll furr-iend. I luv you! Winky winks. Happy Gotcha Day, Brulee! You bring us so much happiness, we can only imagine how Mom Paula feels to share a life with you! Happy Gotcha day, Brulee! You hit the jackpot with Mom Paula, that's for sure. I've been in my forever home for seven years, too! It's amazing how time flies! Happy gotcha day! Happy 7th Gotcha Day Brulee! What a beautiful story, and the love you feel for all your furry companions, those you've said goodbye to and those who are with you now is so obvious! A house without an animal is not a home to me, there will always be something missing. Wow, has it already been 7 years? Love your stories about the girls, and the pictures are always lovely. Interesting about the development timeline. I know more and more dog breeders are waiting until 12 weeks to let their puppies go to new homes. I kind of wish that had been the case with Summit but she came to us at 8 weeks. Happy 7th Gotcha day to Brulee! Happy 7th birthday Brulee! Every time I see pictures of your cats I'm amazed by their eyes. I'm such a sucker for pretty eyes, lol. I hope Brulee has lots of fun celebrating her gotcha day! 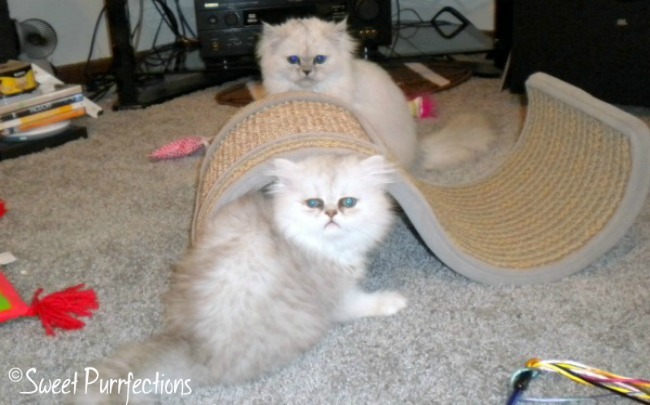 That's one of the major things about the silver Persians is their large green eyes! What a beautiful cat! Happy Gotcha Day! Happy 7th Gotcha Day Brulee, you gorgeous feline! 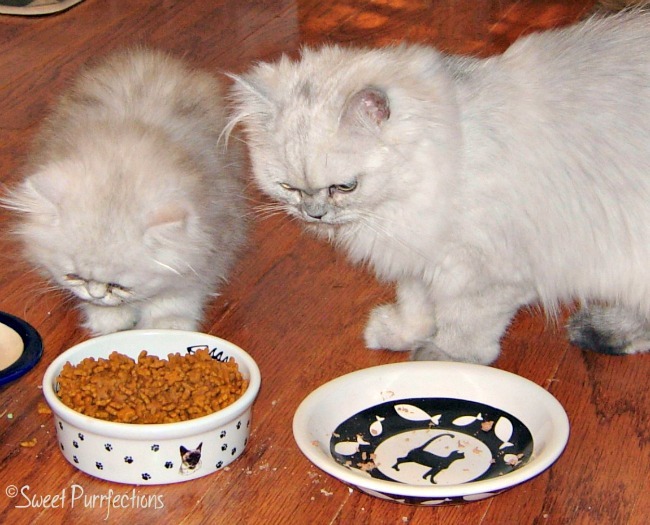 This is such interesting information about when and how kittens should be properly weaned. It sounds like your cat breeder is a real gem who cares deeply about her kitties. Sharing. She was. She is no longer a Breeder but stays in contact. She’s a vet tech! 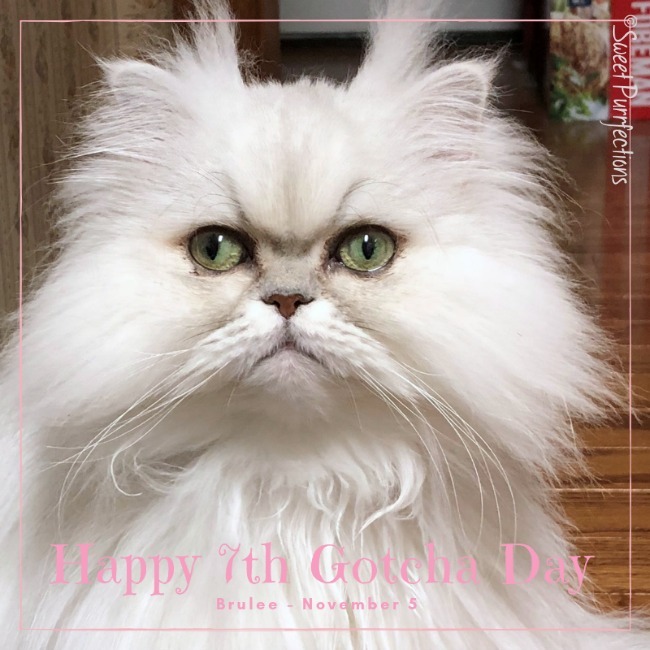 Happy 7th Gotcha Day Brulee- both girls are so beautiful. I really enjoyed hearing about the first days and seeing these cute photos. Aww, happy adoptoversary, Brulee. So lucky you are. Aww, happy gotcha day!! These old photos are so precious. I'm so glad I was blogging when the girls were kittens because I have so many photos and blog posts for memories. Happy Gotcha Day! Brulee sure was tiny when she came to live with you. I am happy that the two of them are becoming snuggle buddies. Aww happy 7th gotcha day Brulee!